Ever wonder how creative people come up with their ideas? Me, too. So many times I look at a new invention, artistic endeavor, or form of literature and think, “How did they ever imagine doing that in the first place?” That is why I am fascinated with problem finding—the processes by which individuals choose the creative tasks they will pursue. 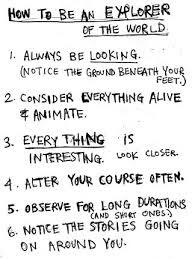 That is probably also why I love Keri Smith’s book, How to Be an Explorer of the World. As the back cover states, “At any given moment, no matter where you are, there are hundreds of things around you that are interesting and worth documenting”—and this book is designed to set you on the path. Can you imagine a better beginning for problem finding? The book includes more than 50 explorations, to be investigated in any order. They range from collecting interesting type faces to pondering and photographing interesting garbage, interviewing people about local lore, and recording phrases from overheard conversations. 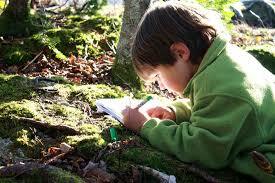 Each exploration is an invitation to curiosity. Take a look. Explore. 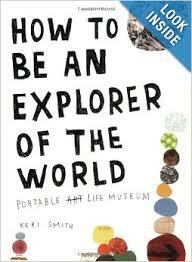 How to Be an Explorer of the World is a wonderful resource just to keep around the house or classroom. It is the kind of book I’d give to a child I loved, or just leave around the house for him/her to discover. It also could be a fine resource for teaching about problem finding. Imagine talking to students about problem finding, introducing the book, and then challenging students to create Exploring the World: Volume 2, a collection of their own original ideas for explorations. I have to think Keri Smith would be proud!